As the "scout signs" which generate the seasons, cardinal signs govern creativity. These signs are restless, active, self-motivated, ambitious, and they often are the leaders in their communities. They can be a bit domineering, but that comes part and parcel with their best qualities of being enterprising, independent, creative, spontaneous and forceful. Here’s how each sign’s unique mix of Quality and Element influence how they express their Cardinal nature. An Aries role is to project himself upon the world through firsthand experiences. Self-expression is paramount to this pioneering sign, and Aries likes to see how far he can go in exploring, discovering and experimenting with the world around him. Aries’ fire element gives him supreme faith in himself along with a fierce sense of courage. His Cardinal nature makes him restless and in need of change for the sake of change. He is assertive too, and manages to get himself known in a fairly short time. Says Aries, "If I don’t attract some attention to myself, how is anyone going to know me?" Right on, Aries! We can all learn from you. True to form, Aries does get to know the right people. (In Aries case, the "right" ones tend to be venture capitalists or high level muckety-mucks who can make some splendid introductions for them!) Where would we be without Aries daredevils to push us forward? Cancer’s role is to actively explore the entire realm of human emotion. That Cancer is both Cardinal and Water motivates this sign to explore new emotional states and experiences. As a Water sign, Cancer is the most subtle of the Cardinal signs when expressing his independence and ambition. But don’t be fooled - those qualities are just as powerful within Cancer as in the other Cardinal signs, no matter how gentle a Cancer outwardly appears. Astrologers often describe Cancer as moody, which can be true at times, but that description oversimplifies Cancers rich textural nature and their ability to accept, initiate or even embrace change when they feel it is necessary. They have a capacity for sympathy and compassion that is unmatched by any other sign except fellow water sign Pisces. Cancers have a wide emotional spectrum, and they generally experience an inner life that combines higher highs and lower lows than the rest of us. Cancer wouldn’t have it any other way! Libras are great matchmakers and know how to get things cooking by introducing individuals to one another in relaxed social situations. This sign mixes with lots of people and communicates often, so a Libra alone is a bit of an oxymoron, or a bit like the sound of one hand clapping! Bewildered Libra would wonder what happened to the other hand. Trying to do anything without the "other half" of the unit seems pointless to them. Libras do their best work bouncing ideas off others and working in partnerships or team situations. Their active, authoritative, Cardinal quality brings them in contact with successful over-achievers like themselves, so they quickly build a data base of influential friends, associates, and contacts. (Need an introduction to advance your pet project? Ask a Libra for help - they will throw a party or arrange a lunch.) Since they’re Cardinal, Libras can be bossy, but they express their dominance in such a charming way that others become easily (sometimes joyfully) wrapped around Libra’s little fingers. Capricorn is a Cardinal sign who initiates activity with the end result in mind. They are not impulsive or impetuous - the Capricorn Earth nature sets goals and plans carefully. Unlike fellow Earth sign Taurus, a sign motivated by money, Capricorn’s motivation is to maintain and improve their reputations. Prestige is candy to Capricorn, for they love being respected for their work. Anything they put their name on has to be the best they can do. They work with almost the same dedication and obsession of a Virgo (OK, I concede that Virgo is hard to beat in area of obsession and perfection). 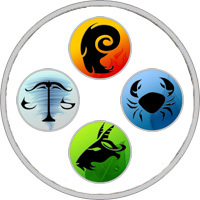 Gaining honor or fame for its own sake will always interest Capricorn, especially if the position allows them to use their substantial leadership abilities. Why would a practical Capricorn accept a high profile position without a big salary attached? Earthy Capricorn realizes they can leverage the title for more responsibility and compensation later. Some people say that each of us is only two phone calls away from people in power. If that is true, and you want to reach someone high up in the stratosphere (the White House?) call your Capricorn first. They know all the right people - and eventually become part of the inner circle themselves.